Say, who’s that girl? That lanky brunette with the wicked jaw? 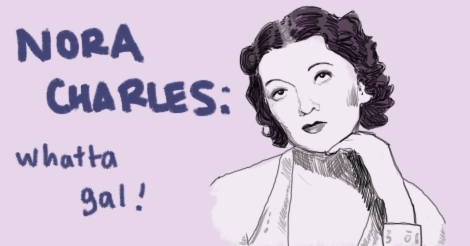 Why, it’s everyone’s favorite lady character from any 1930s film: Nora Charles! But what makes her so great? Lemme tell ya. Mrs. Charles is the wife of Mr. Nick Charles in the Thin Man movies. Have you watched any of the Thin Mans? For heaven’s sake, if you haven’t, do so as soon as you can! It was a formative bunch of films that I was exposed to at a young age and immediately realized that Nora was the role model I needed. She was everything I wanted to be some day. Some people consider this to be a fool’s desire because they believe you need modern role models for modern times. Excuse me please but timeless class acts are eternal. Myrna Loy, the actress who played the character − who WAS the character, imo − was herself a very admirable woman. From what I’ve read about her, she hardly even had to act for these movies. And really, I can’t imagine that any other actress could have done as well with it. She had a tremendous rapport with her Leadin’ Man, William Powell. They were cast together as husband and wife in tons of other movies, too, and it’s always a little jarring, because it just seems like Nick and Nora pretending to be different people. But it’s a winning combination! When I was Little Amanda, I remember the first thing I was enchanted by was the ease at which Mrs. Charles would banter with the husband-man. Ladies back in those days were often shown to be quick-witted and humorous. They had moxie and would frequently have the pluck required to make it in a Man’s World. It never seemed very surprising or like some amazing moment of female empowerment whenever it happened. Occasionally, a guy would remark, “Say, you’re okay, sister!” That was all the wonder expressed. Truthfully, because I watched so many old movies when I was a child, I more or less thought that was how the world still is. Nora Charles seemed to have a good head on her shoulders. She was a rich girl, from money, and had the sort of self-confidence you get from that sort of upbringing. However, she was always kind and would rub elbows with Nick’s low-brow friends without any real snobbery. She would sometimes make comments about how rough of characters they were, but it was required that she remark, otherwise she wouldn’t be as sophisticated and classy. Her clothing was always fashionable and suited her perfectly, but she never seemed like a fashion plate. Sensible Nora, all around. Very importantly, she was a good sport. These movies would involve antics that a different lady would have had dramatic fits over. If Nora Charles was made a fool of, she’d either shrug it off, shoot back a rebuttal, or be annoyed looking for about two seconds. She was supportive of Mr. Charles (a running joke being that he married her for her money), and would encourage him to take cases in order to further the plot of any movie. They had fun together! They were friends! They weren’t sappily and sickeningly displaying their true love for all to see! They didn’t care about traditions or pretenses or most societal expectations. The world was their oyster and also they were continually drunk. She’d drink just as much as the next man and still remained poised while disastrously hungover. Nora Charles: an okay sister!